Real Food folks can enjoy colorful, pink and red food on Valentine's Day just like the rest of the world; and be all the healthier for it. Creation is jam-packed with color, and we get to eat some of it! There is absolutely no need for artificial, toxic food coloring to ever enter our bodies. Okay. Back to a special, nourishing, colorful breakfast. Our Valentines morning tradition is pink pancakes. The food coloring of choice? A lovely, in-season beet. That's all it takes. 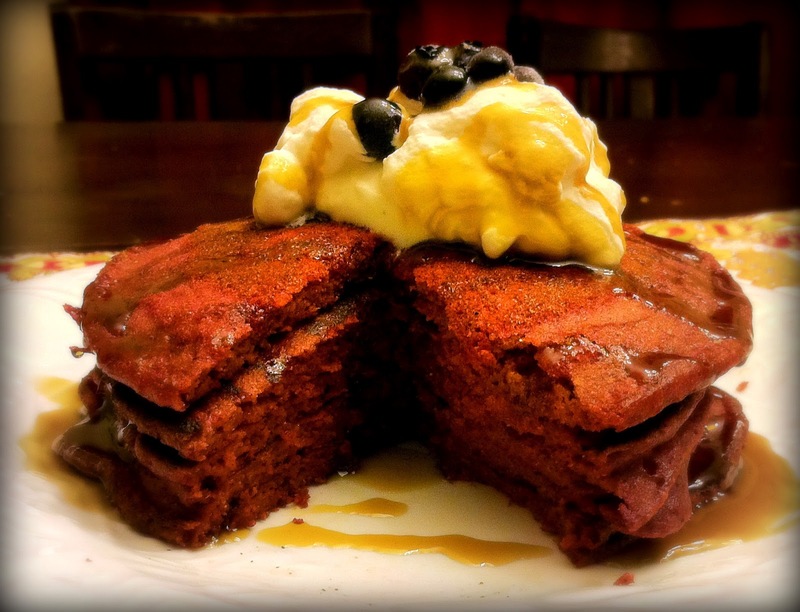 Fear not, the pancakes taste nothing like beets. It just lends it's lovely color to the recipe, that's all. 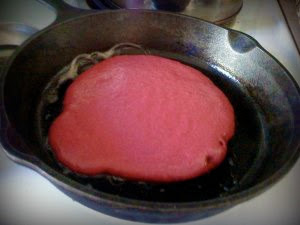 Here's what ya do: simply mix in 1/4 of a cup beet purée (about 1 small beet's worth), either raw or roasted, to your favorite pancake recipe. I use this lovely sourdough pancake recipe. So go. You've got a week to scrounge up a beet. But while you're out, get a bunch of 'em. Next up is a pretty, gluten-free Valentine's dinner recipe, and there will be beets involved. Getcha beet on, y'all! I'm sharing this at Monday Mania, Real Food 101, Barn Hop, Traditional Tuesdays, Real Food Wednesday, Simple Lives Thursday, Pennywise Platter, Fresh Bites Friday, Farm Girl Friday, Fight Back Friday. Oh, thanks for Pre-thinking this and giving us inspiration! I am new-ish to whole foods and raw and your site has been soooo helpful :o) Esspecially since you seem to share my love of the special and beautiful! I have been thinking about the annual tea party I let my two daughters have and trying to think of ways to do it with more whole food. So far I have experimented with strawberries dipped in raw fudge and those were a hit.....these pancakes may just be on the breakfast menu. Keep the inspiration coming, it is very appreciated! these are great - thanks for the idea! and by the way, is that butter or whipped cream on top of those pancakes?!? either way, that.is.awesome. same here! mine treat butter like it's frosting! Awesome idea - my daughter will love this!